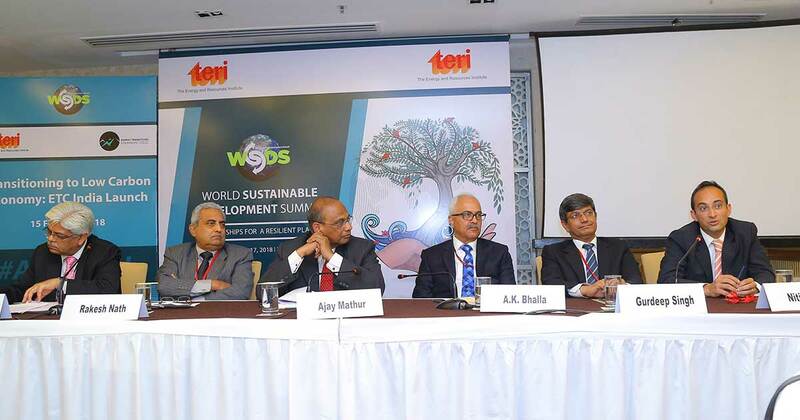 In a landmark session, day one of WSDS 2018 saw the launch of the Energy Transitions Commission India (ETC India), a unique, high-level, multi-stakeholder platform on energy and electricity sector transitions in India. In the first year of inception, ETC India will focus on policy, research, and discourse on decarbonizing the power sector. The Energy Transitions Commission was convened to help identify pathways for change in our energy systems to ensure both better growth and a better climate. The Commissioners bring a diverse and remarkable range of viewpoints and extraordinary depth of experience, coming from across the energy spectrum, including investors, incumbent energy companies, innovators, industrial energy users, public, and academic institutions and foundations, advisors, and academics from across the developed and developing world. ETC India is the first country-specific Commission. India was chosen to have its own ETC as the country is taking great strides in transitioning towards renewable sources of energy. The Indian ETC can, thus, act as a model for other emerging economies as they move to renewable energy sources. It is envisaged that ETC India will bring together a diverse group of individuals from the energy and climate communities. Speakers at the launch focused on the need for such a platform that will allow for deliberations to shape the research and engagement agenda intended to support policy and strategy decisions in the years to come. The launch will enable strong engagement and continuous interactions with policy makers at various levels of government, industry and associations, civil society, and the media to test the analysis and hypothesis formulated through ETC activities in India, said Dr Mathur.